Stop and consider how many things in your life turn or revolve. skate wheels, electric motors, car wheels, microwave turntables, even your PC has bearings in it. The humble bearing makes many of today's machines a reality. Without them we would not be able to make precision items on a massive scale and things would wear out quickly due to excessive friction. This page is designed to give you an idea of what bearings are, what they do and the formats they come in. All things roll and rotate better than they slide. If the wheel did not exist we would be stuck with sliding things everywhere. Consequently little progress in the world would be achieved. Sliding causes friction. Friction is caused by two surfaces resisting movement between them. If however two surfaces can contact each other by rolling then friction problems are significantly reduced. Bearings reduce friction either by using hard smooth balls or rollers, and a smooth inner and outer surface for the balls to roll against or by introducing a low friction surface between the surfaces. These balls or rollers "bear" any loads which they may be subjected to thus allowing the bearing to rotate smoothly. Ball bearings are typically capable of dealing with two kinds of loading condition; radial load and thrust load. Depending on the type of application the bearing is used in, it may experience radial load only, thrust load only or a combination of both. A classic example being the car wheel as shown below. There are many types of bearings, each used for different purposes either singularly or in combinations. These include ball bearings, roller bearings, ball thrust bearings, roller thrust bearings and tapered roller thrust bearings. Ball bearings, as shown to the left, are the most common type by far. They are found in everything from skate boards to washing machines to PC hard drives. These bearings are capable of taking both radial and thrust loads, and are usually found in applications where the load is light to medium and is constant in nature (ie not shock loading). The bearing shown here has the outer ring cut away revealing the balls and ball retainer. Roller bearings like the one shown to the left are normally used in heavy duty applications such as conveyer belt rollers, where they must hold heavy radial loads. 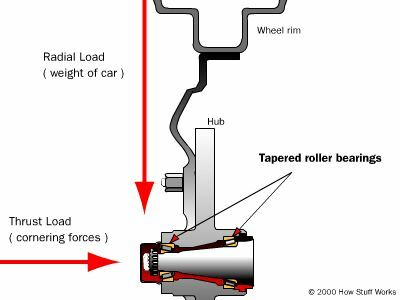 In these bearings the roller is a cylinder, so the contact between the inner and outer race is not a point (like the ball bearing above) but a line. This spreads the load out over a larger area, allowing the roller bearing to handle much greater loads than a ball bearing. However, this type of bearing cannot handle thrust loads to any significant degree. A variation of this bearing design is called the needle bearing. The needle roller bearing uses cylindrical rollers like those above but with a very small diameter. This allows the bearing to fit into tight places such as gear boxes that rotate at higher speeds. Ball thrust bearings like the one shown to the left are mostly used for low-speed non precision applications. They cannot take much radial load and are usually found in lazy susan turntables and low precision farm equipment. Roller thrust bearings like the one illustrated to the left can support very large thrust loads. They are often found in gearsets like car transmissions between gear sprockets, and between the housing and the rotating shafts. The helical gears used in most transmissions have angled teeth, this can causes a high thrust load that must be supported by this type of bearing. Tapered roller bearings are designed to support large radial and large thrust loads. These loads can take the form of constant loads or shock loads. Tapered roller bearings are used in many car hubs, where they are usually mounted in pairs facing opposite directions. This gives them the ability to take thrust loads in both directions. The cutaway taper roller on the left shows the specially designed tapered rollers and demonstrates their angular mounting which gives their dual load ability. The above bearing types are some of the most common. There are thousands of other designs, some standard and some specific applications but all perform the same basic function. Essentially further types of bearings usually take all or some of the characteristics of the above bearings and blend them into one design. Through the use of careful material selection and applying the correct degree of machining precision, a successful bearing solution can usually be found.